May is fast approaching, and with it, the end of the rainy season. At least, what passed for a rainy season this year. Much of California is still in an “extreme” or even “exceptional” state of drought, the highest designation offered by the federal government’s U.S. Drought Monitor. So communities are cracking down on water wasters, right? Demanding that residents take shorter showers and stop watering their lawns? Up and down the state, water agencies use words like “emergency,” “critical” and “dire” but make only modest requests of their customers: voluntary ten percent cutbacks (a few toilet flushes' worth) or supposedly “mandatory” restrictions that, upon closer inspection, are virtually unenforced. "There’s no place in California that should think they have enough water that wasteful or inefficient use can be condoned." 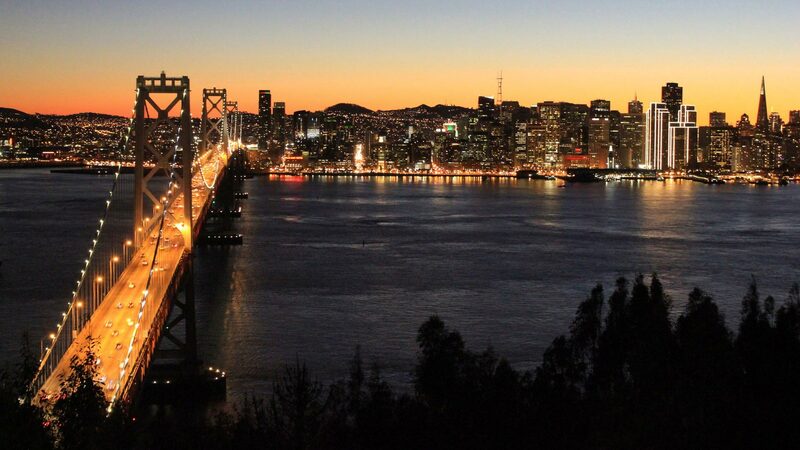 Take, for example, the East Bay Municipal Utility District, or East Bay MUD, which supplies 1.3 million residential customers from Oakland, Berkeley, Lafayette and other East Bay towns. Last week, the utility’s Board of Directors summoned staff members to brief them on how much water is available in the system. The picture presented by Eileen White, a Manager of Operations for the utility, was grim. Key reservoirs are at 50 and 60 percent capacity. Snowpack levels, which indicate how much fresh water is stored as snow in the Sierra, are less than 20 percent. “It’s been a very dry winter,” White told the Board. First, purchase water from the Sacramento River -- for the first time ever -- at a cost of $8 million. Second, continue a request that customers trim water use by ten percent. Despite one of the worst droughts in history, board members agreed that it wasn't yet time for anything more strict. There is no single source of water for California residents; nearly every community gets its supply from a different combination of sources. But the drought is affecting everyone. “For us, it’s actually quite serious, says Frank Jahn, a Public Information Supervisor for the Alameda County Water District, which supplies water to residents of Fremont, Newark and Union City. Jahn’s district relies on flows from the State Water Project, a vast network of pumps and canals that brings water from the wetter north of the state to the drier south. In a normal year, says Jahn, his district would get about 40 percent of its supply – some 17 million gallons of water – from the State Water Project. This year, says Jahn, they’re expecting zero. The town of Cloverdale is in similar straits, says city manager Paul Cayler. “I guess you could call it an emergency,” he says, referring to the town’s primary reservoir, Lake Mendocino, which is at half capacity. A map maintained by the Association of California Water Agencies shows several towns which have imposed mandatory restrictions on water for customers in their service area. But few of these restrictions are enforced, or even enforceable, and water managers concede they’re relying on the honor system to ensure that customers actually cut back. For example, in towns served by the Alameda County Water District, homeowners are now prohibited from watering their lawns more than once a week. Hosing down sidewalks and re-filling pools are prohibited entirely. But customers who break the rules will probably get away with it. Few, if any, towns have the resources to hire teams of enforcement agents, so must rely on citizen complaints, followed up by site visits from department staff. District officials can’t issue tickets unless they see the violation in progress. Cloverdale’s mandatory restrictions also rely on “community compliance,” said Holley. “We don’t have a water cop,” he explains. In towns where water use is metered, one way to lean on water hogs is through monthly water bills, levying a penalty on customers who exceed a monthly allotment. But despite one of the worst droughts in recorded history, water managers say it’s not yet time for such measures. This is short-sighted, according to Peter Gleick, who heads the Pacific Institute, a non-profit water policy think tank in Oakland. Even if the rains return, he says, water resources are finite. Over time, the pressures of population growth and climate change will only further squeeze water districts trying to supply their customers. What many managers really seem to fear is making their customers unhappy. “It can create some adversarial relationships,” says American Canyon’s Jason Holley. There are some places where cities are putting meaningful water rationing into place. Take Santa Cruz, where the drought has left water managers in particularly tight straits. Santa Cruz hasn’t built a new reservoir in 50 years, largely because of environmental opposition. It imports no water from other parts of the state. Recent efforts to build a desalination facility were met with bitter opposition from environmentalists and some residents. 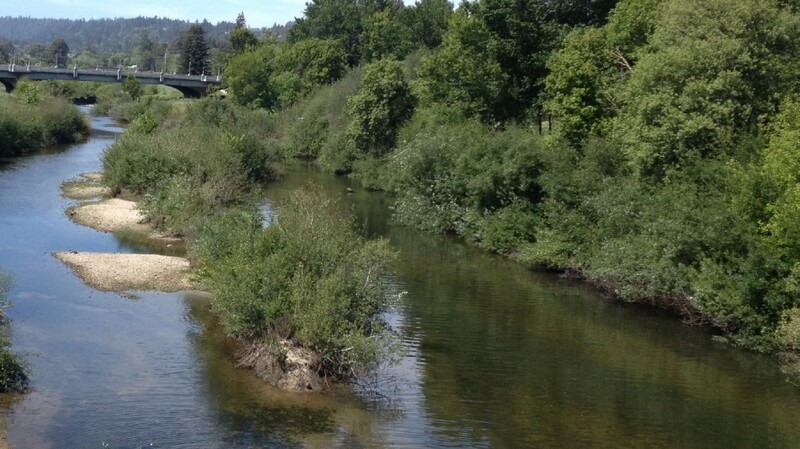 With the city’s primary source, the San Lorenzo River, running virtually at a trickle, the city has enacted some of the most restrictive water policies in the state. Starting May 1, residents in most single-family homes will receive an allotment of 249 gallons a day. Use too much and the price-per-gallon jumps by a factor of ten. Customers who exceed their allotment could see bills climb to $500 a month, or more. Santa Cruz will lose $4 million as a result of asking customers to buy less water. “It’s a big jump,” says Toby Goddard with the City of Santa Cruz’s Water Conservation Office. Goddard says local residents have already done a great deal to conserve water, even without expensive restrictions. But at a certain point, the requests aren’t enough. “I’m not sure just a voluntary call is actually going to move many communities to do something differently,” Goddard says. Goddard points out that these water restrictions will be a burden for his agency, which points to a harsh paradox in the water business: Selling less of it is expensive. Goddard’s office is planning to hire up to 20 new staff members to run the program, respond to customer complaints and questions, and do outreach, Goddard says. That’s $1 million on top of $3 million the agency expects to lose in revenue as a result of selling less water. The city plans to make up the deficit with surplus funds from previous years. But if the drought continues, Goddard says, those costs may have to be passed on to customers. The Pacific Institute’s Peter Gleick says water agencies have a financial disincentive to encourage conservation among their customers. If revenue drops, rates must go up, leaving customers paying more money for less water. “If their conservation programs are really successful, they sell less water and their revenues drop,” says Gleick. He points out that water agencies often have expensive construction costs and overhead. If revenue drops, rates must go up, leaving customers paying more money for less water. Gleick says there are ways around this. 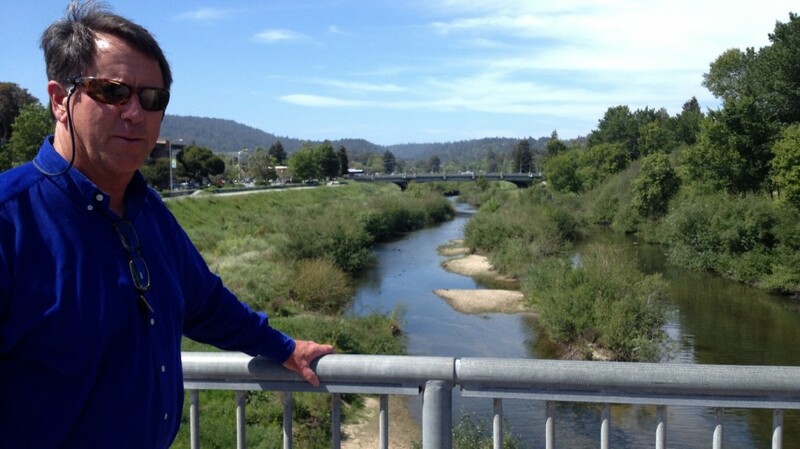 Standing on a bridge overlooking the San Lorenzo River, Toby Goddard says if the rains don't come, the city could face some tough years ahead. "But we'll get through," he says. "I’m sure the community will rally and do what it takes to save its water supply." And if they don’t, it’s going to cost them.